Jesus our Christ is not leading us where He is not going! Expect the darkness to be right there, attempting to stop you. Keep Moving undaunted as You are Led. Expect the evil in some people's hearts to become antagonized by the light that shines from you. They will question your purpose, attempting to pick it apart based on their immaturity, their lack, their fears and unbelief. They may even laugh at you. Expect the Spirit of the Lord who dwells in you to antagonize the spirits that are against the Lord, which dwell in others to provoke them to lash out at you. Expect some to complain about How the Lord leads you because they are rebellious, immature, stuck in their feelings, jealous, envious, and full of self-pity. They may try to tell you there is a better way to do this. Expect those who will get offended by the Truth, to try to tell you that you are wrong, that you are this and you are that... They will find every reason to stop you because they don't want you to Speak and Spread the Truth that will help them and so many others. They don't want to grow and mature. Expect many with you to turn back, because the challenges and the uncomfortableness are too much for them to bear. They didn't allow the Lord to prepare them for this. They may have been playing and now that it's Really serious, they know they will be found out. They may be jealous of your gifts, abilities and anointing, because they want what you have. They do not know the Voice of the Lord, they do not have a growing and maturing Relationship with the Lord..etc...,. God will separate you from those who are not suppose to be with you. Even those who at first were willing to be changed and to be prepared. Expect your flesh to war with your Spirit, attempting to guide you by a lesser way through human power. Your feelings will try to talk to you, don't listen to their voices, nor the voices of your past, your pain, hurt and mistakes. Let Your Faith and Trust Speak Up in the complete Power that God gave them. You know the Voice of the Lord, Listen for the Sound of His Love! With all of this that will happen, the One Thing to completely Expect is the Lord's Power to Guide you through all of this in order to Complete the Work He sent you to do. Listen for the Sound of His Love, His Spirit will not fail you in accomplishing what ever Work that is before you to do for today. 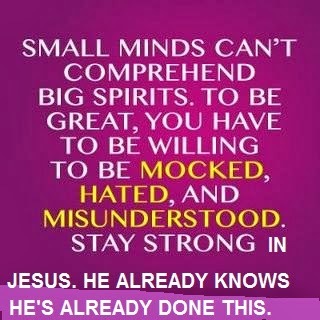 In the Name of Jesus, Keep Moving undaunted as You are Led!